It's that time of year - I'm obsessed with apples. The honeycrisps are at the store (and ready for picking in Wisconsin), we went apple picking, I patched an apple on Aidan's first day of school shirt, and I've made two apple themed desserts lately. 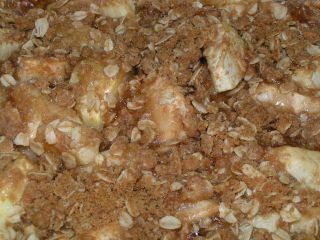 The first of the recipes was a delicious apple crisp based on a recipe on allrecipes.com. Below is the recipe. I basically doubled the crisp portion and used a smaller pan. I can't say I used 4 cups of apples - I just used what was on hand and looked good. It was delicious! In a medium bowl, combine flour, oats, brown sugar, cinnamon and melted butter. Stir until crumbly. Press half the oat mixture into an 8x8 inch baking dish. Cover with sliced apples. This is a Flickr badge showing public photos from SassyPriscilla tagged with crisp. Make your own badge here. 1.I live in Green Bay (actually DePere) and was born and raised in good old Milwaukee... actually the East side... my husband was from Elm Grove. We lived in Wauwatosa for several years. 2. My mom was a cardiac nurse at Children's Hospital for years. 3. I'm on a blood thinner because of pulminary emboli also. 4. You enjoy Chicago... my daughter just bought a condo right on Michigan. Pictures of it on my blog someplace. Your baking looks so great... went through several months of your posts. I love new recipes and your Apple Crisp looks and sounds delicious--I'm going to make some, too. So perfect for this time of year. By the way, your mom's comment makes me smile. What a sweet mom you have. This looks yummy! Proud of you!